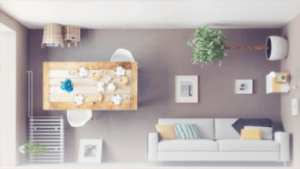 Usually when you go about building your own DIY tree house you consult conventions, look for existing plans or examples to take cues from (if not build from directly). 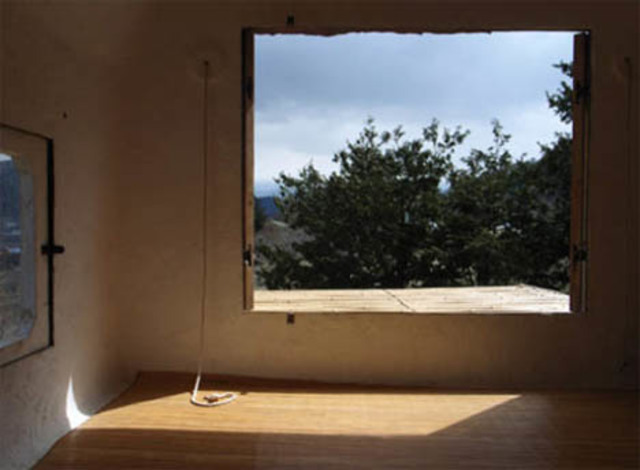 In traditional Japanese tea-master style, this designer avoided hiring an architect or skilled carpenter to construct this “tea house built too high” in Japan. The experimental and experiential nature of the design and construction process are quite evident in the finished project, photographed by Edmund Sumner. The building pushes structural capacities to their limits and bends (or breaks) design traditions in its organic, evolved-over-time form. Rather than using trees on the small family plot he owned, he went to a local mountain to harvest two tall logs for the support of his structure. In turn, this allowed him to situate the building where he wanted it and to fully integrate the “trees” with the building they are supporting (since they will not grow over time). 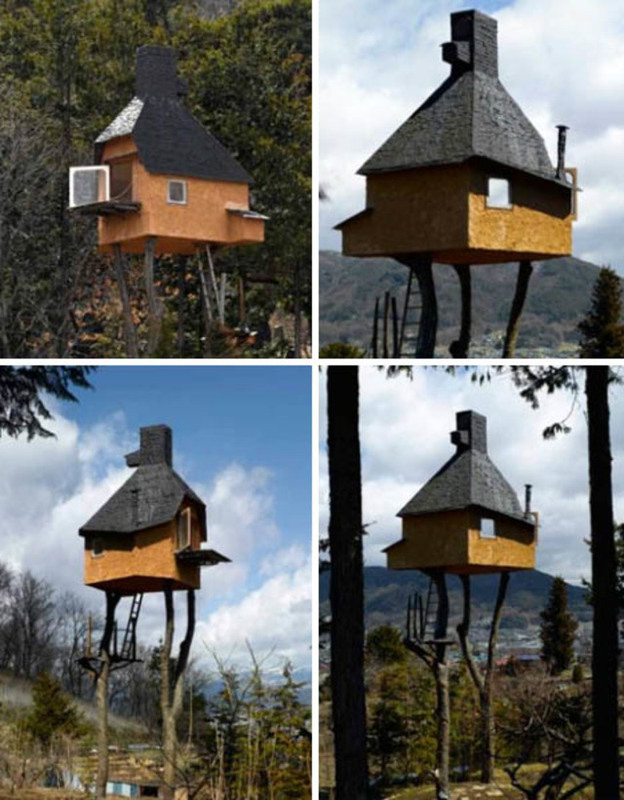 The resulting “house on stilts” is inaccessible except when the builder wants it to be, requiring the use of a tall ladder to scale the first length of trunk before you can reach the built-in ladder that ultimately leads to the DIY tree house design. Sometimes he leaves the ladder nearby, sometimes he doesn’t. So technically, maybe it’s only too high for the people he wants to keep out of it. Aren’t privacy and serenity two key characteristics in any truly great tea house, after all? 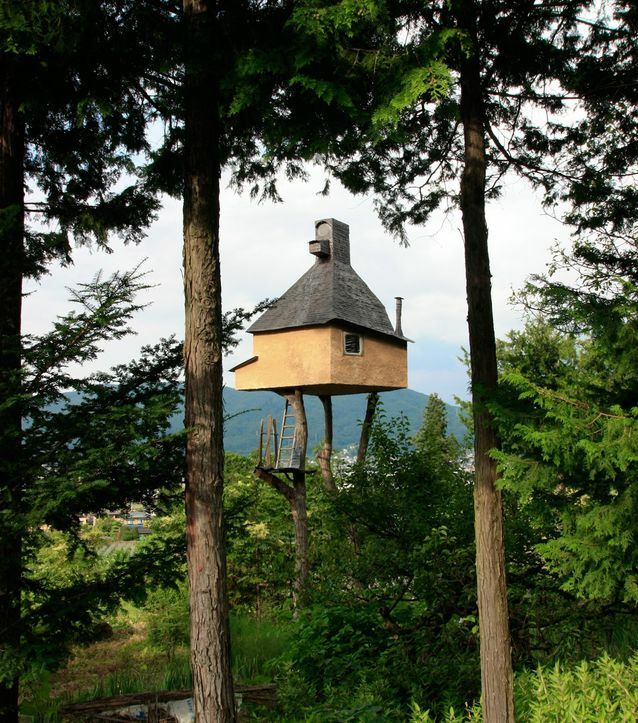 Japanese architect and historian Terunobu Fujimori is known for his eccentric and unusual creations, almost always made from natural materials. Other projects include the Nemunoki Museum of Art in Kakegawa, which Fujimori refers to as a “hairy mammoth” for its hand-rolled copper roof connected to the hillside by a “spine” of living grass. Though he’s well known in his native country, Fujimori didn’t become a recognizable name in the West until the 2006 Venice Biennale.